Publication date: not stated, 2012? | Kindle edition only from Amazon. Into Occupation: Peace Activism in Palestine and Israel is a diarized account of the ten weeks that MBA student and business consultant Mohsin Kirinde spent with the renowned activist organisation, the International Solidarity Movement, in the Occupied Territories. It recounts, in vivid and highly personalised detail, the everyday realities of life under occupation, and in active resistance to Israeli aggression. In doing so, the book aims at illuminating as best as possible the key opacities of the conflict. Far from being solely a blow-by-blow account of force and fear complemented by historical and factual analyses, it is the richly detailed story of extraordinary circumstances that have been normalised in the public mind. – Attending bi-weekly protests in places such as Bil’in, Ni’lin, Hebron and Iraq Burin, and the concomitant gross IDF violence. – Witnessing and monitoring settler infractions in East Jerusalem and all over the Nablus region. – Assisting in community projects, such as rebuilding Bedouin villages demolished by IDF bulldozers in the Jordan Valley, leading children’s summer camps in Silwan, and theatrical projects in Jenin. – Dealing with the Israeli legal system to attempt to stop arbitrary imprisonment, torture and beatings of international peace activists and Palestinians. While detailing Israeli actions against the Palestinians, these descriptions are regularly juxtaposed with time spent with Israelis – the people who were ultimately accountable for the crimes being witnessed. The book is punctuated by discussions with Israelis regarding the gross misdeeds their government had been committing in front of Kirinde’s very eyes, and often directly against him – including being shot at by Israeli soldiers; getting arrested and beaten by border police; and being chased through the streets of Hebron by a unit of soldiers and having to subsequently flee the city, disguised, under cover of darkness. Thus, the situation of the Palestinians is not depicted in isolation, but given regular commentary by the everyday civilians who are sustaining it. The account is highly personal and unique. Kirinde did not go into the ISM with a history of activism; indeed his background was an inestimable distance removed from that of a typical activist. He graduated from Oxford in 2005, and was working for a management consulting firm in Paris. He was about to start his MBA at one of the world’s top business schools at the end of the summer. Regardless, having seen the horrors of Operation Cast Lead at the turn of 2009, he decided he could not stand on the sidelines any longer. 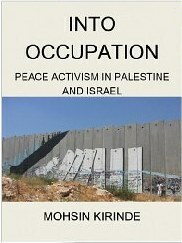 So, in addition to being an account of the realities of life under occupation, the book also details Kirinde’s own journey within the resistance to the occupation, as someone not cut from the activist cloth, but rather as someone from a fairly typical political standing, who simply could not stand to see the Palestinians continue to suffer, and did something about it. This entry was posted in 6. BOOKS, Israel / Palestine. Bookmark the permalink. Typical knee-jerk activist.He saw the destruction in Gaza. Did not contextualize the information, and decided Israel was the bad guy. Final indoctrination by a subsidiary of the terrorist organization, the Palestinian Solidarity movement, put him over the edge. The ISM is not renown, it is infamous. It believes that suicide bombing is justified. Chris, I suggest you read the book before you judge the author. There is certainly no knee-jerk reaction or indoctrination. He is a very thoughtful and knowledgeable young man who writes honestly about his experiences. I read the article summary about the ISM on the link you gave. It is not backed up by evidence: perhaps that is given in the full pdf article, which does not seem to be available. It is a mostly a fair summary of the ISM activities, which they find despicable and I find heroic. I would question the article on a few important points. I don’t believe ISM is anti-Israeli, rejects the existence of Israel as a national homeland for the Jews, or is part of a campaign to de-legitimize Israel. It protests the occupation and settlement of Palestinian territory, and the inhumane treatment of Palestinians resulting from this. I do not believe that the ISM justifies suicide bombing or any kind of terrorism. Although armed resistance against an unjustified military occupation is legitimate, the PLO and ISM are really committed to non-violent methods, because this is what has been shown to work in the cases of South Africa, Romania, Northern Ireland and Tunisia. A point I agree with in the article is about the stone-throwing by children in the Palestinian demonstrations. I think the Palestinian leadership should put a stop to it, if they can. Kirinde’s book has some interesting comments about it. Its a pack of lies about ISM. Besides which, Israel has murdered a number of observers, film makers and UN workers as well as one ISM volunteer. Israel beat and robbed 600 such people in a single incident in 2010, killing 9 of them.